Our industry leading surface residue meth testing kits are designed to determine the level of contamination in micrograms on any hard surface. Meth Labs or meth users leave behind toxic residues that can be harmful to the occupants of a home. Our Meth Testing Kits are laboratory tested for accuracy and quantitative data – All NOISH Kits include LABORATORY TESTING FEES and a certificate of analysis. Each surface sample contains a moistened 3ml Methanol sterile gauze to ensure you remove the residue from the surface for the lab to test using their LC-MS machine. Once a surface area of 100cm2 has been swabbed, you simple place the gauze back in the vile and send to the lab for analysis. Each discrete surface sample when received at the lab is tested for: Methamphetamines, Amphetamine, Pseudoephedrine and Ephedrine. 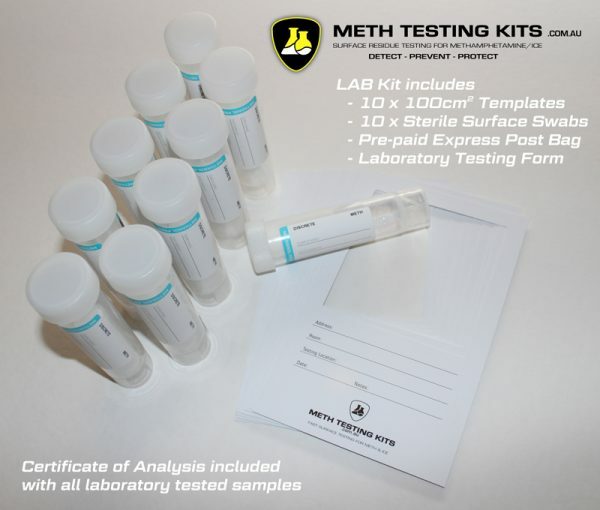 Each 10 pack includes the COC (Chain of custody form) for the lab and a 500g pre-paid express bag for fast return shipping of the meth testing kits. Once the meth residue samples have been received at the laboratory your swabs they will be tested using an LC-MS Machine – on completion of the meth testing, we will provide a certificate of analysis detailing the levels of residue detected in each meth testing kit surface swabs.